Test the waters, or improve on existing skills, with wakeboarding lessons in Devon. Professional tuition is tailored to individual needs, and all equipment is provided. A wakeboarding experience in Devon is a perfect gift, whether for beginner-boarders or seasoned addicts! The beauty of wakeboarding is that you can go at your own pace, and push your limits at the same time. And it's very, very cool. Let a powerful speedboat pull you around the beautiful and perfectly glassy waters of the Exmouth Estuary, while expert instructors watch your form and assess your abilities, giving you tailor-made tuition to improve your skills quickly and naturally. Go at a speed you are comfortable with, but with a learning curve as steep as this, progression is quick and it's often a case of 'scream if you wanna go faster'! . Our Wakeboarding Devon Experience consists of a 1hr session, however you should arrive 15-30 minutes before your booked time, and make time for drying off and winding down afterwards! Once you have been fitted for your buoyancy aid and wetsuit, one of your two expert instructors will brief you on wakeboarding techniques and relevant safety issues. During the session, participants get two 15-minute 'sets' (two turns being pulled). This may not seem like a very long time, but there are few arms that can still hang on to the back of a speedboat for more than 15 minutes! The learning curve is also very steep, in 15 minutes you can go from complete novice to being comfortable crossing the wake. Instruction and advise is given throughout your pull and hour long session, and even afterwards - the instructors love to see people progressing and becoming as passionate about wakeboarding as they are! Allow yourself time to dry off - and time for your hands to stop shaking - after your session.Your arms may be a little sore the day after wakeboarding but don't worry, it's really worth it. The main season for wakeboarding in Devon is from April - November. You should be able to swim (50 metres), and be comfortable in the water if you want to learn to wakeboard (certainly if you want to enjoy yourself)! Wakeboarding in Devon is available to participants over the age of 8. Under 14's must be accompanied by a parent/guardian. This sport is unsuitable for pregnant women. The Devon Wakeboarding Experience lasts for one hour, which includes two 15 minute 'pulls'. Arrive 30 minutes before your booking, and remember to allow for drying-off time afterwards. Participants: The Wakeboarding Devon Experience is for 1 participant. Provided there is room on the boat, Family and friends are more than welcome to join the trip and watch as you learn to wakeboard. There is a small charge for this, and it provides superb photo opportunities to capture your moments of triumph and your epic face-plants! Wakeboarding can be just as entertaining for spectators as it is for the boarders themselves. If there is no room on the boat, spectators are welcome to observe from the bank. Don't worry, you will still see the rises and falls of your loved one! You will need to have your own towel and swim suit/shorts. Dry Bags are also provided, so that cameras, phones and valuables can be safely brought on-board. The beautiful Exmouth Estuary location is a huge benefit of wakeboarding in Devon. 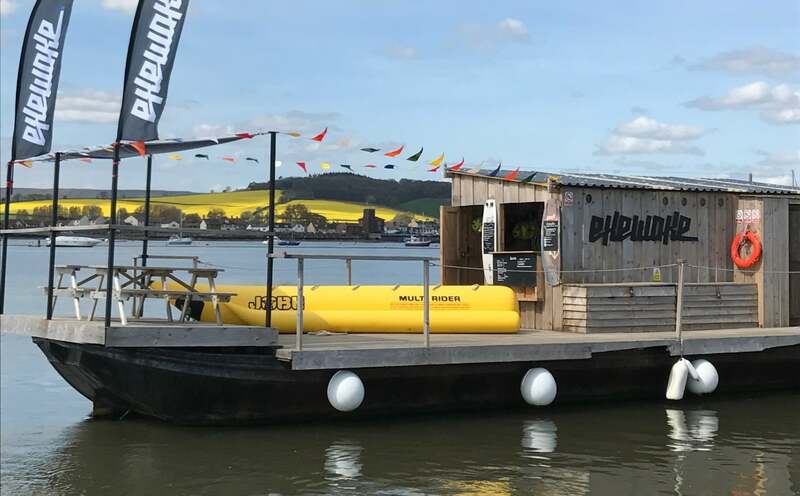 Being sheltered, and with it's own micro-climate it is generally ideal for wakeboarding, however extreme weather conditions can still occasionally affect the area. It is in your interest to contact the centre the day before your experience, and on the morning of your trip if you are still unsure. The whole experience ,from purchasing the vouchers to landing back on dry land, was well organised. Communication between Experience Days and their partner was faultless. On the day of the activity, the exewake team were very friendly and helpful. This beginner highly recommends giving wakeboarding a go, great fun in a beatiful area! Had a quick land lesson (2 minutes) then straight out for a solid 25 minutes of wakeboarding with instruction, would definitely recommend. Had a top morning in Exmouth, the guys were super helpful and all their gear is top notch. Will be back soon! This was around a year ago. The instructor was amazing and really built my confidence up enabling me to stand on the board and really enjoy my first experience. The setting could not be better, the staff were friendly and patient! the whole experince was excelent really recomend it to anyone.